My second home libraries of librarians profile subject is Darrell Joyce. Darrell is a an aspiring public librarian who is currently working on a multicultural collection development project for Oakville Public Library. The project, which is part of his practicum with the OPL, involves researching the city’s multilingual demographics and making recommendations for future multilingual collection development strategies. Due to graduate from the University of Toronto’s iSchool this spring, Joyce is also a virtual reference intern with AskON and a Co-chair of the Faculty of Information Student Council’s Social Committee. 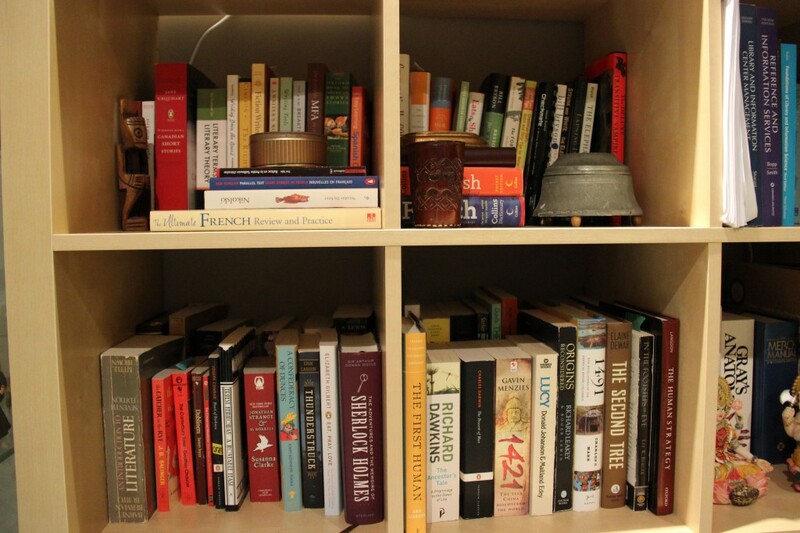 Darrell’s home library organization may be visually chaotic, but it is well considered. Using the deep Ikea Expedit shelving (pictured below), his books are shelved two rows deep to conserve space. While Darrell calls this organization scheme “hectic/eclectic,” he has the entire collection catalogued using LibraryThing, a $15 CueCat scanner purchased from the LibraryThing website and his iPad. “I group my books mostly by subject or interest area in my own little schema,” says Darrell. “So, all cookbooks are together (whether published or handwritten), books for copy editing/writing and librarianship are together, English literature, medical, religion, history/culture, [and] a growing pile of random books ‘to be read,’” he explains. 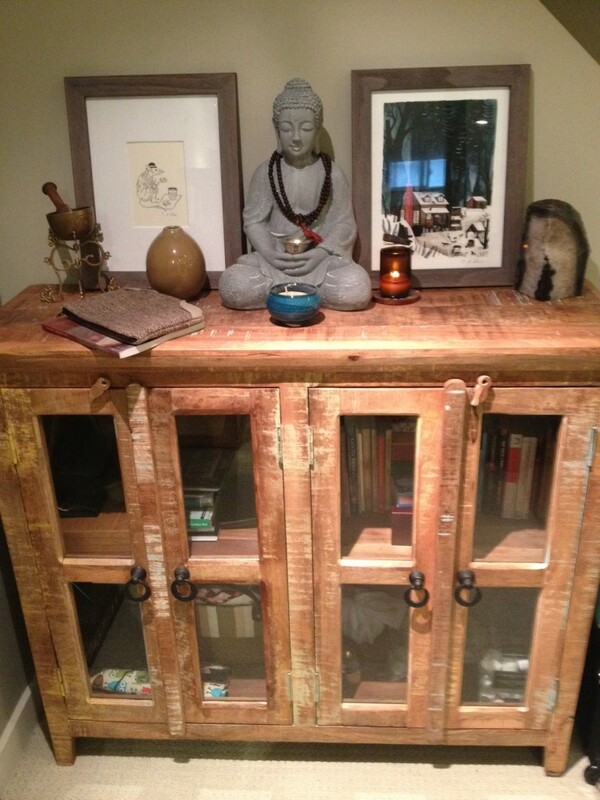 The latest addition to Darrell’s arrangement is a cabinet that houses his “Buddhist/Zen/Eastern spiritual book collection.” Pictured at the top of the page, the cupboard on the upper right is the home of his Buddhist and meditation book collection. The rest of the shelving unit serves as storage for his craft and art supplies, but Darrell was inspired to create a separate space for his Buddhist and Zen books. “On the top is my Buddha statue, some original prints from a new children’s book that I fell in love with (The Wildwood Chronicles) and some altar trinkets and representations of various elements of nature,” he says.